“Where you go I will go; and where you stay I will stay” (Ruth 1:16, NIV). The story of Ruth is a beautiful narrative about resilience and accompaniment. Rendered vulnerable by the deaths of their husbands and the natural disaster of famine, Ruth and Naomi clung to one another for comfort and strength. As we read the book of Ruth, we see both a human story and a God story, the former “incarnating” the latter. As a human story, we read about the spirituality of solidarity. In the divine realm, we read of God’s redemption, which is mirrored in human action. One Great Hour of Sharing is a special opportunity for you and your congregation to walk with those in need through the work of the Church of the Brethren. When you give to this special offering, you support Core Ministries like Brethren Volunteer Service, Congregational Life Ministries, Global Mission and Service, the Office of Ministry, and the Office of Public Witness. You also support the work of Brethren Disaster Ministries and Global Food Crisis Fund. 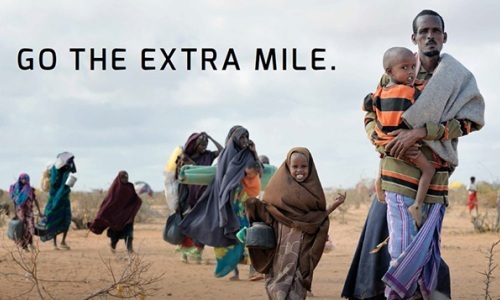 With your help, we accompany those in need across the country and around the world. As we walk together, we recognize God among us and receive strength for the journey ahead. The suggested date for One Great Hour of Sharing is March 20. Learn more and find worship resources for the offering at www.brethren.org/oghs or give today at www.brethren.org/giveoghs . “They voluntarily gave according to their means, and even beyond their means, begging us earnestly for the privilege of sharing in this ministry to the saints” (2 Corinthians 8:3-4). During what the Apostle Paul calls a “severe ordeal of affliction,” the early churches of Macedonia somehow managed to “overflow in a wealth of generosity” for their sisters and brothers in need. Their own extreme poverty combined with their abundant joy resulted in this overflow, and as Paul testifies, they not only gave according to their means, they gave beyond their means. Yes, beyond their means! Even more remarkable, they actually begged to share in the “ministry to the saints.” Giving is a privilege. Have you ever imagined what it would be like not to be able to give? But God provides all we need, enabling us to be in a constant posture of giving. All that is ours is God’s, so everyone has a gift to give. God does not leave anyone out. God has created a world where there is more than enough; the sheer joy of that blessing is sharing it! Giving back to God is a matter of faith—it is the natural reaction to our saying “yes!” to following Christ. Once you know the invincible love of God and the Good News of the Gospel, you can’t help but share it. In the sharing of your resources, you are living out your confession of faith as followers of Jesus the Christ. For well over six decades, we have been putting our faith into action and making a difference, alongside literally millions of other Christians throughout North America, through One Great Hour of Sharing. 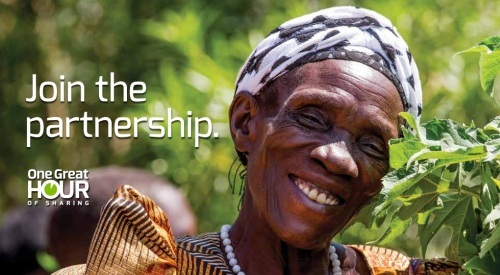 This offering helps empower people across the nation and around the world. Giving itself is a gift. A privilege. An opportunity to respond to God’s outpouring of love for you. Giving through One Great Hour of Sharing not only changes the lives of individuals and communities in need, it changes the world. Join our ministry of saints as we receive our offering. Let’s overflow in a wealth of generosity and feel our own hearts, minds, and lives change just as we help to improve and transform the lives of others. Amen. One Great Hour of Sharing is a special opportunity for you and your congregation to support the life-changing ministries of the Church of the Brethren. Find worship resources for this year’s offering at www.brethren.org/oghs or give now at www.brethren.org/giveoghs . Mount Morris Church of the Brethren. Plans for our garden at the Mount Morris Church of the Brethren began on a snowy evening in 2009. Experienced and rookie gardeners, church people, limited income adults, and curious individuals gathered to discuss planting 32 garden plots across the street from the church. We decided that this garden would be dedicated to growing produce for the Loaves and Fish Food Pantry. Five years later, the garden has become not only a place to grow food but a place to grow friendships. Many individuals have helped plan and tend our community garden. In January, we gathered to share favorite hot dishes, pore over seed catalogs, and brainstorm ways to improve the garden. A local farmer offered his Japanese beetle-free farm for growing sweet corn and winter squash. Elderly residents of the Pinecrest Community grew seedlings of tomatoes, peppers, and herbs that were transplanted to the garden in May. In the spring, members of the church and community planted 50 pounds of potatoes, 20 asparagus plants, 20 new strawberry plants, and more. The “Going to the Garden” grant from the Global Food Crisis Fund and the Office of Public Witness, which empowers congregations to start or improve community gardens, has helped us reach our goals. Thanks to the extra funds, we have improved access to water by purchasing hoses and instruments to collect rainwater off the church. We have increased productivity by building new frames to contain each plot of vegetables, and by installing cattle gates to support the growth of tomato plants. We have also strengthened the community aspect of the garden by painting two weathered picnic tables and adorning them with umbrellas for shade. To further improve the community of the garden, we offer planned activities. Gardeners gathered in June at the Mount Morris Senior Center to can strawberry jam. 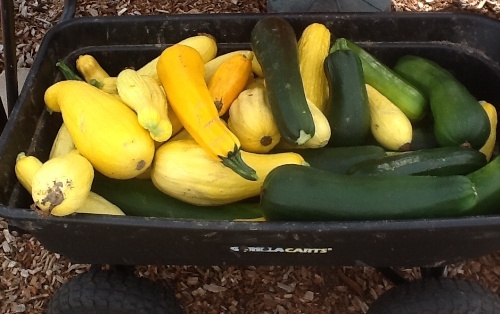 Monthly potlucks allow gardeners to prepare tasty dishes and share from their garden’s abundance. The garden is also available for picnics. By harvest time, our community garden will provide over 5,000 pounds of vegetables to the food pantry, and residents of Pinecrest Community will receive two deliveries of sweet corn. We are so thankful for the “Going to the Garden” grant. It has helped us grow healthy, fresh produce for many, and cultivate meaningful relationships. It has helped us come a long way since that first snowy night. “Going to the garden” is a joint initiative of the Global Food Crisis Fund and the Office of Public Witness. Visit brethren.org/givegfcf to support this ministry today.